Using the "share" button for that is dumb. Just use the touchpad. That's what it's there for, right? I guess that's PS4 only. on XO... "XBox, quick save." I was planning to wait until closer to release hoping prices drop and I could exceed specs. However, I'm starting to feel like I'm missing out on mods for these games. I just want to play on my couch/bed with a controller though, so I'll have to look into the Steam Big Picture mode. When I can get the GOTY edition with all the DLC for <$30 I am in! (And that is saying a lot because usually I wait until $20). So about a year and a half after release, maybe two. Tulsa would be a way better setting. Assuming I had a PS4, I would definitely wait for a GOTY with all of the DLC. However, this is one game that I wouldn't care about waiting for a price drop. [Intelligence 10] Maybe I should download the uncompressed video somewhere online and in-turn realize that the graphics are actually 5x better than Skyrim! 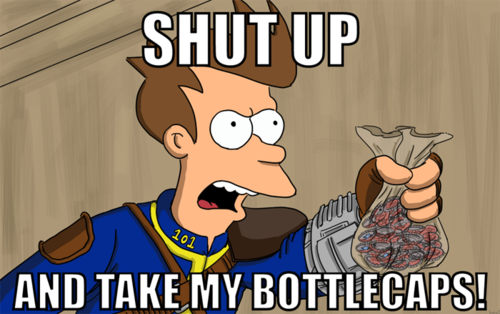 Fallout 3 happens to be on sale on Steam and matched on Amazon this weekend with the announcement of 4. Decided to rebuy 3 since my version is an old Games for Windows version on a disc somewhere, figured $11.99 was worth it to give it a re-play since I never played the DLC and to have it in my library. Now to figure out how to get it to work right under Windows 8. Last edited by fumanstan; 06-07-15 at 08:44 PM. How does FO3 run on PC? I have it on both 360 and PC. I'm not talking about graphics but which one has the least amount of bugs? I remember it crashing somewhat frequently when I played it on the PC. I can't remember if I was running XP or Vista though. There are issues running the game on Windows 7 and 8 that seem inconsistent for users. It's kind of sad actually that Bethesda hasn't tried to actually make it more stable. I have windows 7 and from reading steam forums FO3 doesn't run well I was getting excited reading up on the cool mods. Oh well. I fully completed Fallout 3 and New Vegas on Windows 7 and never had a single issue. I have both games on Windows 8 now and haven't had any issues there either, although I haven't done a full playthrough of either. I wasn't even able to launch the base game on Steam without some tweaks and manually installing an updated Games for Windows Live app. has that gfw live abomination been removed? I played Fallout 3 on Steam from start to finish without a single error. You're one of the lucky ones. I downloaded and started it up last night. 20 minutes in and the game freezes on me. Activated compatibility mode and started up again. This time it only took five minutes to freeze again Run as administrator... Freeze again This time i went all out editing the .ini file and started up *crossed fingers* and it works! Played an hour without any problems. It pops up whenever i boot the game up but you can exit out with one button press and it won't show up again thank god. Every time I see this thread bumped and hope to read something new about Fallout 4, it actually turns out to be bitching and complaining about how Fallout 3 runs. Can we not bump the Fallout 3 thread and converse about that game in there? Releases November 10th of 2015!!!! Big baby Jesus I can't wait!!!! I'm loving that Fallout basically contains its own Minecraft now as well.